Yes, that delightful rockin' elf is back by popular demand! But this musical is something very different. Teresa Jennings has created a primary musical that is great for any school's winter performance, and it is ideal for any school studying the voyage of America's great western explorers. It is 15-20 minutes in length and can be performed with groups of almost any size. 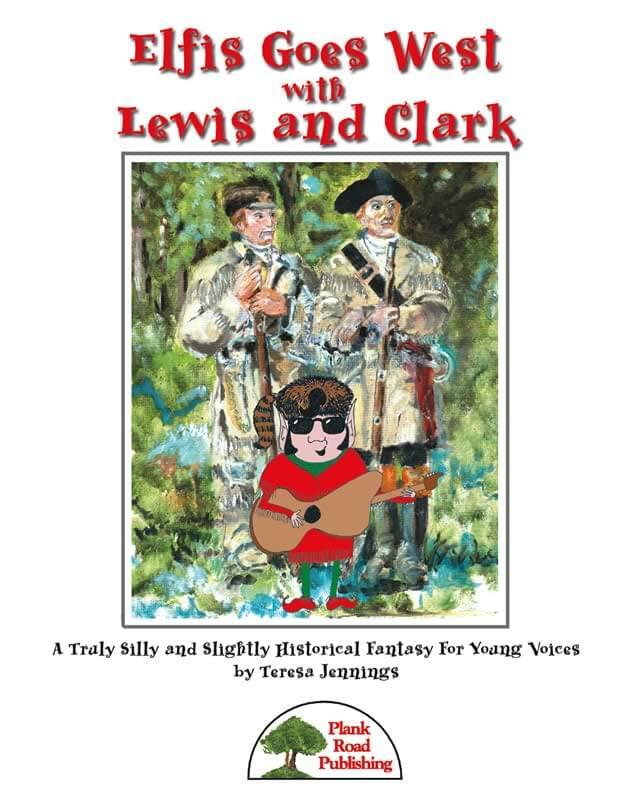 While its plot is, shall we say, not quite historically accurate, this silly adventure provides the perfect springboard into a more in-depth unit of Lewis and Clark by the classroom teachers in your school. Our tale goes something like this: Lewis and Clark accidentally wind up at the North Pole when they fail to turn left in North Dakota, despite the advice of their guide, Sacajawea. They have the great good fortune to meet up with Santa Claus and his usual entourage, including the renowned singing elf, Elfis. Santa gives Lewis and Clark and their team of explorers a ride back to the western territory on his sleigh. He returns to the North Pole, but leaves Elfis and several elves behind to join the expedition west. Unfortunately, the ride through the sky has left Sacajawea with a nasty cold and an acute case of laryngitis. Since she is the only one who can communicate with the native peoples they encounter along the way, they have a problem. The natives do not know whether the explorers are friend or foe. Elfis to the rescue! He sings a song of friendship and brotherhood, and lo and behold, they understand. Thanks to the universal language of music, Lewis and Clark are able to resume their mission and map the way through the west for future generations. As with all of Teresa's musicals, this carries a valuable message and comes with everything you will need to produce a memorable performance including comprehensive notes, plans for scenery and costumes, and even reproducible posters and program cover. The recording is state-of-the-art, featuring rich orchestrations and top professionals playing real instruments. When a full orchestra is needed, it's there; when Elfis plays rock, the band is the best! Imagine the fun your kids will have dressing up for this musical, from Elfis, to the North Pole crowd, to the explorers. You won't be sorry... your kids will have a great time! Minimum of 5. Ownership of kit is required to buy Student Editions.